Here is another of my “rotating” recipes in the fall/winter. I received it from Dee N in 2008 after enjoying it when I visited her and G’s home in Maryland with Amanda. It is fabulous! I have made a few changes in the subsequent years to make it mine. 1 pound Italian hot or sweet sausage (with casings removed) — I usually use 2 links of each, sliced down the middle and then cut in 1/2″ pieces. Cook sausage in a bit of oil. Drain and return to the pot, adding the onion and garlic. Cook for a few more minutes. Add additional cup of beef broth and tortellini. Check for seasonings. Sometimes I need to add a bit of salt but truly the combination of beef broth and wine usually suffice. Turn the heat off. add the parsley. Serve with some parmesan cheese grated over the top of the bowl of soup. *To peel and chop the Roma tomatoes, cut an “X” into the bottom of each tomato and place in boiling water. Watch carefully until the skins split down the sides — it doesn’t take long, 3-4 minutes at the most. Then drain, peel and chop. I love the taste of fresh tomatoes in this soup. This is a very easy-to-make, hearty soup and perfect for those dreary, cold days in our PA fall/winter! So, instead of writing about the top I made, I will tell you about my 17 month journey to lose 20 pounds. May 2016, as I was going through photographs for Amanda, I found a picture of me. I said to DannyO, “look at this picture!! !” It was taken maybe in 2005. I was just sitting at a picnic but what I noticed was how strong and fit I looked! I decided then and there to make some real changes!! I was sedentary, fat, and basically unhealthy!! I joined Ebensburg Fitness and committed to going 3-4 days a week. I tried classes but I’m solitary by nature and they weren’t a good fit for me. So, I lifted weights and used their cardio machines. My weight didn’t budge, but I persisted. By September, I had lost 3 pounds… I persisted… by December, I lost 6 pounds. Ebensburg Fitness gave me the jump-start I needed but once winter hit, I suspended my gym membership. I just cannot be out in the cold with my neuralgia. However, I continued to lift at home and use my elliptical at least 3 days a week. Continuing to persist… By Brent’s wedding, I had lost 10 pounds. The real change came in April. Amanda gave me her old Fitbit. Then I REALLY realized that, even with my 30 minutes on the elliptical, I was only getting about 3500 steps in each day. Then 3 weeks ago I stepped on the scale and it said 139.5. I didn’t believe it. I made DannyO step on it. He said it was 7 pounds light compared to the doctor’s scale. I threw that scale away and bought a new one. I stepped on it… 139.5!! I made DannyO step on it. He said it was 7 pounds light, but then remembered that, at the doctor’s, he had his heavy work shoes and jeans on!! At that point, I believed the scale!! Woo Hoo!!! I’d like to lose 5 more, but, I don’t care if I do!! The challenge will be this winter, when it is cold out. I will have to find some way to continue. I haven’t quite figured out what I’m going to do. My eating habits changed a bit too. Most days I eat 2 meals and one substantial snack. I try to include vegetables and fruit, although I find it easier to get my fruit quota in. After I drink my morning coffee, I drink water. On weekends, I allow myself a few adult beverages if we eat out and I enjoy whatever restaurant food I order. I also still eat a goodie every day. To me, this is more of a lifestyle change than a diet. From 160 to 139.5 — Woo Hoo!! Peanut Butter Cookies and Coffee ~~ A magical combination! This peanut butter cookie recipe came in a book my Aunt Agnes gave me as a wedding gift in 1980. I have made no additions to this recipe as it is perfect! I always use “Jif” peanut butter but of course you can use whatever you like. I do not suggest using butter as a substitute for shortening. It makes the cookie too “oily.” These are a great comfort snack! Blend shortening, peanut butter and sugar. Add vanilla and eggs. Sift all dry ingredients together and mix in. Roll into 1-inch balls and flatten with fork. (I dip the fork into some sugar and flatten each cookie in an X pattern ). 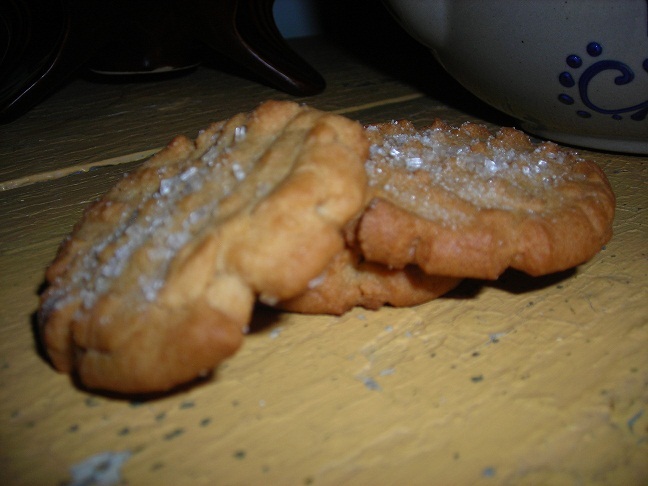 For a little more crunch, I put a few sugar crystals on each flattened cookie. Bake on an ungreased sheet (I use parchment paper) for 12 minutes at 350. Well now… somehow my post got wiped!! Let’s see if I can do this again!! I found a few recipes and found one that I liked and then another and then another… so I mashed them together. It took me 15 minutes to prepare the container and put the rest together. Once your container is prepared, it should only take 5 minutes to make these wipes! Round container — it can be any size but remember that the shorter the paper towels are, the smaller each wipe will be. Use an exacto or craft knife to cut a hole in the center of the lid — you may need to cut it larger later. Measure and cut the paper towels to fit. Place the fitted paper towels into the container and slowly pour the liquid over the towels. It won’t take long for you to be able to pull out the cardboard center of the paper towels. I decided to tackle a vintage Butterick pattern circa 1950’s. I love the line of this coat, especially the front seaming detail. I made myself a deal (I can talk myself into many things…) If I’ve sewn 4 projects from my stash, I can purchase a piece of fabric. And I’ve committed to purchase good fabric. Unfortunately, Joann Fabric is no longer the place to find good fabric as they’ve moved into the “quilting and crafting” arena. The fabric I used for this jacket is from Marcy Tilton. The fabric is sold by the 1/2 yard. One thing to consider when using vintage patterns is their sizing is different even from today’s patterns. In RTW, I wear a 4-8 depending on the fit. In modern patterns I wear a 10-14 depending… In vintage patterns I wear at least an 18!! Yikes!! Fortunately for me, I no longer look at sizes even when I’m shopping in the stores. It’s all about fit! This pattern, because it isn’t a fitted design has a bit of wiggle room. My next few paragraphs will get a little technical, so if you want to just look at the pictures, that’s okay!! One of the problems with fabric yardage and this pattern is that the sleeves and shoulders were included in the back pattern piece. Putting the back and sleeves on with the front required some more puzzle piecing. The shoulders were actually a dart at the top of the pattern piece. The piece was sewn into the front pattern piece, topstitched, then the dart was formed for the shoulder. At that point, the back seam was sewn. I had to get creative again… because I had to take the pattern pieces right up to the edge of the salvage, it was showing after sewing the back center seam. I solved that problem by taking a strip and topstitching it over the seam! I also had never made a bound button hole before — THAT was another “first” for me! I lined it — which meant I had to replicate the pattern steps again. Fortunately I’m a fast learner and that went easier! Overall I’m very pleased with the finished coat. I have so many vintage patterns still in my collection and because my mantra is “if I don’t use it, it goes,” that means I must use these patterns. After I’ve made a few more modern patterns, I will tackle another vintage pattern… because I still have lots to choose from!! After writing my last blog on minimizing, I had someone ask about getting rid of sentimental things. This person recently lost their parents and I was careful to say it probably shouldn’t be done immediately. But truthfully, sentimental things can become, in themselves, clutter!! I want to share my thoughts and some photos of what I’ve kept and why I’ve kept them. Perhaps as you see my thought process, it will help you make those hard decisions. As I love order, I will try to methodically go through what I’ve been given and or received and kept. I have some paper things that are precious to me — those I will talk about another day. What you will notice about what I’ve kept is they are, with few exceptions, all things that I use. Hopefully as you go through my memories, it will make you smile AND give you courage to minimize your sentimental items. Here goes… Grammy and Pappy Savering. My Pappy died in 1988 and Grammy in 2009. Pappy was a complex man but my first memory in my life involves him. He had gentle hands. Grammy was wonderfully quirky. She didn’t have a bad thing to say about anyone!! Truly, she loved, how she loved!! She prayed for me daily and I knew when her Alzheimer’s progressed to the point that she could no longer pray. I miss her!! Pappy’s Toy Box. He made this for Sue and me when we were little. It wouldn’t pass today’s standards because the top slams on fingers!! I use it to store my winter scarves, hats and gloves. The “mashed potato” bowl. Pappy usually didn’t go to church. When we all trouped to Sunday dinner at Grammy’s, Pappy would have it ready including a pile of mashed potatoes in this bowl. Gram gave this to me one day when I was visiting her. I use it as my mixing bowl. Grammy’s vase. She couldn’t grow anything-no green thumb on her but she tried! This pink vase reminds me of her love of color — I use it in the summer for a fresh plant. Grandma and Grandpap Gay. Grandma Millie was killed by a drunk driver in 1969. Grandpap Gay died in 1999. I love what I’ve been privileged to care for of theirs. The Hoosier Hutch. It is a practical piece of furniture for our kitchen. Grandpap gave it to us when he was still alive, probably 25 years ago. We stripped it years ago and stained it. You will notice the edge of the enamel is worn off. That is where Grandpap Gay set his cigarettes and they often burned down completely!! The sauerkraut crock holds our snacks. The music room light. This light hung in their music room. Uncle Ted was gracious enough to let me have it. It hangs in my music room! It is a converted gas light. Joe Bones (DannyO’s Dad). I only knew him for about 12 years or so. He was so nice to me — that Grace Brethren gal who married his Catholic son — he made these primitive sewing room accessories. We were privileged to get one. I absolutely love this duck!! I am so blessed that my Momma and Daddy are both still living. I have my Daddy’s little toy he played with as a toddler… this little guy doesn’t take up much room but makes me smile every time I see him 🙂 I love the worn patina of him too! My Momma has given me one thing that I treasure — this little bunny. She gets put out in the Spring with my other bunnies and sheep. There you have it!! The few things I’ve chosen to keep do not have great material value, but they have a story attached to them — a story that is important to who I am. I think that’s the answer to what to get rid of… does the item have a story attached to it that is important to you? If it’s just clutter, it will not bring you joy, even if it came from your parents and grandparents. I can truly say that the items I’ve shown you are important to me/us and have value and with few exceptions, a practical use in our decluttered home. You can do it!! Go forth!!! When October comes, all thoughts turn to “comfort food.” At least in our house they do! From October to March, I regularly make soups and pies and Beef Barley Soup is in the rotation. I cut this recipe from a Family Circle magazine so many years ago. Of course, I’ve changed things around to make it better! 1 cup of boiling water for the dried mushrooms — if you are using fresh mushrooms, remember to add an extra 1 cup of water to the pot! This is the dried mushroom step… Rinse mushrooms, cover with 1 cup of boiling water in small bowl. Set aside. Saute onion, garlic (and sliced mushrooms if using fresh) in oil in large soup pot over medium-low heat until tender, but not browned — about 5 minutes. Increase heat. Add beef and brown. Add beef broth, water, wine, carrot, potatoes, celery (celery seed if using), salt marjoram, pepper and bay leaf. This is the second dried mushroom step… Drain mushrooms, adding liquid to pot. Chop mushrooms; add to soup. If you didn’t use dried mushrooms, add another cup of water to the pot. Bring to boiling. Lower heat; cover and simmer 20 minutes. Add barley; return to simmer. Cover and cook 10 minutes or until barley is tender. I will say, I prefer the dried mushrooms but in our little town of Nanty Glo, dried mushrooms are often hard to find. Another note… you can use any ground beef you have but if you use another kind, with more fat in it, you will have to strain the fat from the pot before you add the rest of the ingredients. I prefer to use ground round. I had the privilege of speaking to EBC’s MOPS group on Tuesday. What a wonderful group of ladies. Their theme this year is “Free Indeed.” (I think… anyway, it’s something about freeing yourself from things that weigh you down). One of the precious members, J, read my blog about minimizing MY way and asked if I’d speak to them. I did!! Yay me!!! For someone with social anxiety, this is a great victory!! Anyway, I put together a list of “tips” that would help them in their decluttering journey. I spent several days on it, writing down what helped me and what worked. The many minimizing websites can, in themselves, be clutter. I wrote succinctly all they really need to know! It was so well received, I thought I’d share the list on my blog. Important first tip… a moratorium on buying!! Set a number-3 months was mine-and vow to purchase nothing but necessities until three months is up! You may have to get creative, but you can do it! Staging Area: Pick an unused corner, something you won’t trip over. Be prepared for an initial mess. You need three boxes, piles, bags… KEEP – THROW – DONATE. Make a weekly trip to Goodwill/Salvation Army. When a “donate” bag is full, put it in your car. Don’t try to sell things unless you need the money. It is more hassle than it is worth! You also need one “I’m not sure” box. When finished with each room, label that box (kitchen, bathroom… etc.). Put it away for 6 months. (Mark it in your calendar). If, after 6 months, you haven’t used anything in the box, give said box away!! One important note right here, right now… DO NOT DECLUTTER your hubby’s/partner’s stuff unless they are on the journey with you (unless, of course, you need something to fight about). Corral their stuff as best as you can. Set a timer. I found that the longer I worked, the more I put in the “keep” pile. If your babies are down for a nap, don’t work the whole nap… work for 30 minutes, then take a coffee or tea break! Remember, this isn’t a sprint but a marathon!! If you are moving things around as you declutter, make a “key,” which tells you where the new storage place is for said item… ask me how I know this is important!!! You can see a bit of my shiny laminate countertops-uncluttered!! Pots and pans… You generally need 1 of each size. Get rid of all others. Knives… same goes (except steak knives). Get rid of that knife block and store knives in a drawer. Plastic storage containers… one or two of each size (unless, like me, you provide meals for your parents-I need a few more since I’m always taking food to my Momma and Daddy). If replacing them is under your $$ amount, you can get rid of the extras!! You know that crock of spoons, spatulas, more spoons and spatulas by your stove?? Put all of them in a box and give that crock a good cleaning. Pull them out as you need them. By the end of 30 days, you’ll have pulled out what you really need to use! Give the rest away. Pantry/Freezer-the moratorium on buying should include food. Dig into your pantry – get creative and use what you have. Again, I used a number… for every 3 meals I purchased ingredients for, I used only my pantry/freezer for one. Countertops… I like to work clockwise… start at one end of your countertops and evaluate what is on it. Most everything should go into a drawer or cabinet. My countertops have a TV, Paper towel holder, dish detergent (in pretty container), coffee pot, painted bread box, and the crock holding my serving/cooking spoons, spatulas. That’s it!! There is one corner with darling DannyO’s things, which I have not been given permission to get rid of… my one compromise. Otherwise, I have gleaming old formica countertops. I am blessed!! This room is easy. Pick your dollar amount and pitch everything you don’t use under that amount!! I decided on my specific products… hair, skin, face, teeth, and pitched everything else. I now make my own facial products. If you want to know what I use, check out my blog. I spent the money and purchased all new hangers. Black for fall/winter, beige/light purple for spring/summer. I got rid of all other hangers (Goodwill will take hangers). If you have too many clothes but struggle to get rid of any, decide you will get rid of one in four. If it doesn’t fit you, get rid of it!! If you have gained weight, don’t hold on to it unless you love it. I held on to one pair of jeans, which were my favorite and after 15 months of working out, I finally fit into them. But I gave everything else away. I used my “I’m not sure” box a lot in this area. Makeup – I decided on a daytime and night time look and got rid of everything else. I really didn’t need 10 tubes of lipstick!! I also chose one look for spring/summer and fall/winter for my nails and got rid of about 15 nail polish bottles. Simplifying will truly free your mind for other things. Hair — this is a very personal choice. I cut 18 inches off of mine because it was taking so much time, effort and money to maintain. For me, $110 every 6 weeks became an expenditure that I decided to for-go as I simplify my life. Again… minimalizing MY way!! This was hard for me. I ended up going with giving away 1 out of 4 to begin with. I’ve revisited my books once a month since February 2016 and finally have all I need-about ¼ of my original library. You will notice I didn’t talk about toys!! My “babies” are 31 and 35 so I have no experience with that! My kids didn’t have a lot of toys because we didn’t have a lot of money. If you are overwhelmed by toys and your kids are old enough to help, I would suggest tackling it this way. Ask them to choose 10 toys to give to children who have no toys. If there are still too many, pick 10 more and put them away. If, after 6 months, they don’t ask for them, give them away!! Take your time. It took me 8 months to get rid of 850 pounds of “stuff.” I’ve revisited every room in our house and have gotten rid of lots more as I recognize what I REALLY need. Good Luck! !